Reference number for this case: 11-oct-54-Meral. Thank you for including this reference number in any correspondence with me regarding this case. An article in the newspaper "Les Nouvelles de Bretagne et du Mans" for October 14, 1954, reports events of Monday, October 11, 1954, at 6 a.m. in the town of Méral in the Mayenne. Baptiste Potin, 40, a resident of Meral, was going to his workplace at Les Barres de Méral, riding by bike, going towards Saint-Poix, when he saw in front of him, high in the sky, a shining orange ball which seemed to be above Saint-Poix. It seemed to descend as he approached. Arrived at the top of the hill, at the exit of Méral, Mr. Potin was surprised to see landing before him at about 600 meters, near the power transformer, this luminous ball which barred the road. Frightened, he stopped at a good distance. Placed on the ground, the ball had the appearance of a flattened disk in the shape of a dome, with a diameter of about 4 to 5 meters. Its orange brightness was so extreme that it dazzled him. Looking to the right and left, this light allowed him to see distinctly the hedges and the trees at more than two hundred meters. This "saucer" seemed translucent to him, somewhat "like nylon", and in the middle he distinguished a rather indistinct black shape that did not move. At the end of some eight or ten minutes the object became redder, it rose slowly at first, without noise, resuming the round shape it had at the beginning, and soon it disappeared at high speed towards the North-West in the direction of Le Pertre. Mr. Potin resumed his journey and when he crossed the place where the "saucer" had stopped, he saw a kind of cloud that dropped something like bright snow. Arrived at the farm of Lese Barres, he was surprised, seeing himself in the light, to be covered with a kind of fluff, like the people who "plucked the geese!". This kind of weird snow was a little sticky between the fingers, like wax. It was embedded in his clothes, leaving many white traces that an energetic brushing could not remove. The newspaper said that everyone had commented on the facts with animation, and that Mr. Potin had never been so afraid of his life. Various other shorter version were subsequently published in the Press. To Aimé Michel, the date became October 14, 1954. The white substance would not have remained long on his clothes, it would have "soon" disappeared "without leaving any traces." The initial color of the "ball" is white and the black form begins to become a "silhouette". This will have ufologist classify the case as a close encounter of the third kind. On this subject, a articulet around 2017 on the website of the Méral wotn hall rather evokes a "black line". But in the course of the versions, we end up being told it was a "character". With Jacques Vallée, citing the newspaper La Croix on October 16, 1954, the date is still false, the witness is no longer Mr. Potin but, for some reason, "Mr. Duvivier." whereas Michel indicated that the "transparency" of the object is assumed by the presence of the silhouette, it becomes a certainty. For Figuet and Ruchon, the case is still wrongly dated, and it is no longer a question of a ball turning to a disc, but only a disc all along, which changes color from white to red. Finally, one finds around 2017 on the website of the Méral city council, listing unusual stories of the commune, some information that seem unpublished previously: the ball was "the size of the moon", the watch and the dynamo of Mr. Potin stopped during the observation and ever functioned again. And it would seem that among the people who had questioned the witness and observed on his jacket the "sort of white fluff", there were not only the curious but also the gendarmes. It seems that I was the only one to have checked the presence and location of the Moon that evening; which was not in vain. Monday morning, at 6, Mr. Baptiste Potin, aged 40, resident of the community of Méral, left for his day at the Barres of Méral. He was climbing the hill of the borough on his bicycle, towards St-Poix, when he saw in front of him, high in the sky, a brilliant ball of orange color which seemed to be above St-Poix. It appeared to go down while approaching. On the top of the hill, at the exit of Méral, Mr. Potin had the surprise to see this luminous ball landing in front of him at approximately 600 meters and very close to the power transformer station, barring the road to him. Seized by fear, Mr. Potin stopped at a good distance! Landed on the ground, it had the aspect of a flattened disc in the shape of a dome, its diameter was approximately 4 to 5 meters. Its orange luminosity was so mich intense that it blinded him. While looking on the right and on the left, he managed to note that this light enabled him to distinctly see the hedges and the trees within more than two hundred meters, at 6 o'clock in the morning. This "saucer" appeared translucent to him, a little like nylon, and in the medium he distinguished a black form, rather indistinct, which did not move. At the end of some eight or ten minutes the object becomes redder, it raised slowly initially and without noise while regaining its round shape of the beginning, and soon it disappeared at high speed towards the North-West, in direction of Pertre. Mr. Potin, taking the road again, crossed the place where of the "saucer" had stopped, a sort of cloud which dropped like brilliant snow. Arrived at the farm of the Barres, he had the surprise to see himself, with the light, covered with a something of the aspect of sleeping bag feathers, as the people who "pluck geese!" This sort of supposed snow was a little sticking like wax between the fingers. It was encrusted in its clothing leaving many white traces that an energetic brushing could not remove. Needless to say that everyone discusses on the facts with animation. As for Mr. Potin, he had the fear of his life! Mr. Harald Kreutzberg, the Austrian Serge Lifar, inhabitant of Seefeld in Tyrol, observed, whereas he was in its garden, a flying saucer which flew over the small locality during a few seconds before moving towards north and disappearing behind mountains. Some inhabitants of Seefeld also observed the phenomenon and vainly tried to photograph the mysterious machine. Aimé Michel indicates without giving the date precisely but mentioning the case in a discussion on alignments of UFO sighting reports of October 14, 1954, that in Méral, a peasant who was getting ready to return from the fields saw a ball of orange color arriving, which landed for the ground not far from him. He approached, and saw a disc in the shape of a dome with a flat bottom. The object emitted a powerful gleam which illuminated the countryside on a radius of 200 meters. The machine seemed translucent insofar that a black shape could be seen as in silhouette. The witness observed this during 10 minutes, then the color of the object changed to white, it took off and disappeared quickly in direction of the north. "There was a kind of luminescent mist which fell slowly on the ground. I looked at it with curiosity then returned at home. While taking off my jacket, I realized that my clothing was covered with a layer of white matter, a little sticking, like paraffin, which soon disappeared without leaving a trace." Aimé Michel indicates that the white matter was posed on clothing of the witness but not on his face nor his hands, and he thinks that whatever this matter was, it can be the fact that the clothing was at ambient temperature which made that the matter on the clothing was not sublimated. The authors indicate that in Meral, in the department of Mayenne, France, on October 14, 1954, a farmer was getting ready to leave his field when he saw an orange-colored ball arrive and land on the ground not far from him. He approached the object and saw that it was a dome-shaped disc with a flat bottom and it emitted a blinding light which illuminated the field for about 200 yards around. The craft appeared to be translucent and a dark shape could be seen silhouetted inside it. For approximately ten minutes the witness watched the thing, and suddenly the color of the object changed from white to red and it took off and disappeared into the north at great speed. After it left, the witness went to the spot where the craft had been and found a sort of "luminescent steam" falling to the ground. He watched for a while and then went on home. When he arrived there and took off his jacket he found that his clothes were covered with a layer of white, somewhat sticky residue, not unlike paraffin, which soon disappeared without leaving any trace. The authors indicate that this was first reported in Aimé Michel's book "Flying Saucers and the Straight Line Mystery", New York, Criterion Books, 1958. October 14, 1954, Meral, France. A farmer in his fields at dusk saw an orange-colored ball land on the ground not far away, after which a blinding light was turned on that illuminated the farmer and his fields for 200 yards around for some 10 minutes. Oct. 14, 1954, nightfall, Méral (France). A farmer, Mr. Duvivier, observed an orange sphere land and went near it. He found it was shaped like a flattened dome, 5.5 m in diameter, and gave off a blinding light, which illuminated the countryside for about 200 m. It was transparent, and a dark figure could be seen inside. After remaining at ground level for 10 min it flew north, while a bright cloud slowly fell to the ground at the site. When the witness arrived home he found his clothes covered with a white film of adhesive substance, not unlike paraffin wax. (La Croix, 16 oct 1954) (62; M 174). Jacques Vallée gives a wrong witness name and confuses the date at which the case was publicized in the regional place with the case date. 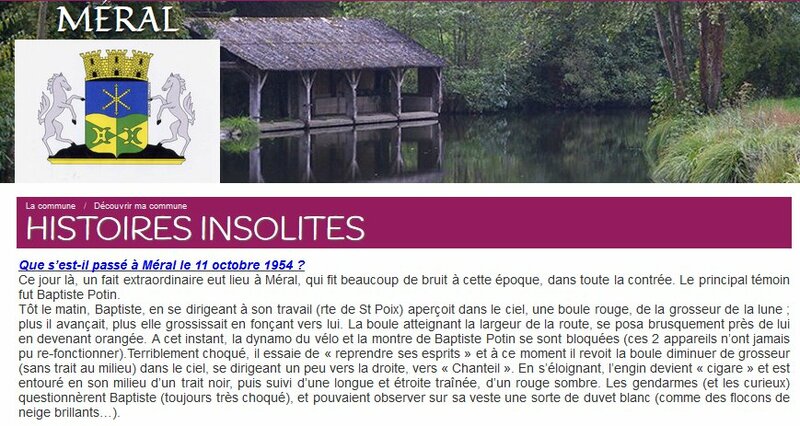 The authors indicate that on October 14, 1954 in Méral in the Mayenne, according to a newspaper and their personal files, an inhabitant of the village, Mr. Duvivier, saw a brilliant ball landing. "The apparatus was transparent. In the insideinterior I distinguished a black silhouette. The disc remained so for ten minutes. Then the gleam became redder. The apparatus took off and moved away quickly in the direction of the North." Mr. Duvivier decided to go to the place where the landing occurred, where he noticed a kind of shining cloud, which fell slowly on the ground. When he was back home, he realized that his clothes were covered with a white film, a little sticking "like paraffine." The authors indicates that on October 14, 1954 at twilight in Méral, Mr. Duvivier, farmer, was on the point of returning from the fields and saw a ball of orange color which arrived and landed on the ground. He approached and saw a disc, flat at the lower part, in the shape of a dome, which seemed translucent and released a blinding gleam that lighted the countryside on approximately 200 meters. A black shape was visible inside. The disc remained like that for ten minutes, then its color changed from white to red, it took off and quickly disappeared towards the north. The witness then went where it had been posed, and he told "there was a kind of luminescent mist which fell slowly towards the ground ". Arrived home, he realized that his clothes were covered with a white stuff, a little sticky, like parafine, which disappeared without leaving traces. It had some on the clothes but not on the face nor the hands. The authors indicate that the sources are Aimé Michel in "A Propos des S.V." pages 215,216; case 255 of the Vallée catalogue; C. Garreau and R. Lavier in "Face aux ET" pages 141,142; La Croix for 10/16/54. October 14, 1954, Meral, France: orange disc lands, humanoid, 10 mn, glowing hue, white layer, sticky substance on site. Jean Sider indicates that on October 11, 1954, in the twilight, in Méral in Mayenne, Mr. Baptiste Potin crosses the road after the takeoff of a UFO and finds there a kind of cloud which drops like a brilliant snow. Arrived at his workplace, he notes that he is covered with a kind of sticking stuff like wax and that even an energetic brushing cannot remove it completely, many white spots remain. Jean Sider indicates that the source is L'Indépendant de Chateau-Gontier for October 23, 1954, page 6. Godelieve van Overmeire indicates that on October 14, 1954 in France in Méral in the Mayenne, at twilight, farmer Duvivier observed the landing of an orange sphere. He went closer. It had the shape of a flattened dome, a diameter of approximately 5,50m and it emitted a dazzling light illuminating the countryside in a radius of 200 meters. It was transparent and inside, one could see a dark silhouette. After having remained on the level of the ground during ten minutes, it flew away towards the north while a brilliant cloud went down gently towards the ground of the site. When he returned home the witness noted that his clothing was covered with a white film of adhesive substance, similar to paraffin. The source is indicated as Jacques Vallée in "Chronique des apparitions ET", Denoël 1972, J'Ai Lu collection, pages 280, 281. The website indicates that on October 14, 1954, in Meral, France, a farmer was leaving his home when a glowing ball landed not far from him. It lit up the fields for 200 YD round. The domed disc appeared to be translucent. Behind the glow he could see a dark shape moving around. The source is indicated as Randle/Estes, FOV pg269. Albert Rosales indicates that according to Aimé Michel, in Meral, France, in the evning of October 14, 1954, a farmer saw an orange object land in his field. Approaching, he saw a domed disc so brilliant that it illuminated the fields for more than 200 yards around. It was transparent, and a dark shape could be seen silhouetted inside it. After 10 minutes the luminosity changed from white to red, and it took off. A slowly settling luminescent mist was left at the spot. Arriving home, the witness found his clothes covered with a soft white substance resembling paraffin, which soon evaporated. Albert Rosales indicates that the source is Aime Michel. Jérôme Beau indicates that on Thursday October 14, 1954, in the twilight, in Méral, in France, 1 farmer observes the landing of 1 orange sphere. It approaches, noting that it has the shape of a flattened dome, of a diameter of 5,5 m and that it emits a blinding light illuminating the countryside on a radius of 200 m. It is transparent and, inside, one can see a dark silhouette. After having remained on the level of the ground during 10 mn, it flies away towards the north, while a shining cloud comes down gently towards the ground at the site it had just occupied. While returning home, the witness noted that his clothes is covered with a white film of adhesive stuff, relatively similar to paraffin. Jérôme Beau indicates that the source is La Croix, October 16, 1954. The website indicates that on 10 October 1954, in Meral, France, "an object was sighted that had an appearance and performance beyond the capability of known earthly aircraft. One object, about 5 feet across, was observed." The website indicates that on 14 October 1954, at 18:00, in Meral, France, there was an orange flattened dome, 5.5 meters in diameter; a dark figure could be seen inside. A farmer observed an orange sphere land and went near it. He found it was shaped like a flattened dome, 5.5 meters in diameter, and gave off a blinding light, which illuminated the countryside for about 200 meters. It was transparent, and a dark figure could be seen inside. After remaining at ground level for ten minutes it flew north, while a bright cloud slowly fell to the ground at the site. When the witness arrived home he found his clothes covered with a white film of adhesive substance, not unlike paraffin wax. The website comments that "an object was observed. Occupants of the craft were seen. Angel hair was found. One orange ball, about 20 feet across, was observed by one experienced male witness on a farm for ten minutes. A silhouetted being was seen." The website then adds that a farmer saw an orange object land in his field. Approaching, he saw a domed disc so brilliant that it illuminated the fields for more than 200 yards around. It was transparent, and a dark shape could be seen silhouetted inside it. After 10 minutes the luminosity changed from white to red, and it took off. At the spot was left a slowly settling luminescent mist. Arriving home, the witness found his clothes covered with a soft white substance resembling paraffin, which soon evaporated. The sources are indicated as Webb, David, HUMCAT: Catalogue of Humanoid Reports; Michel, Aime, Flying Saucers and the Straight-Line Mystery, S. G. Phillips, New York, 1958; Lorenzen, Coral E., Flying Saucer Occupants, Signet T3205, New York, 1967; Lorenzen, Coral E., Encounters with UFO Occupants, Berkley Medallion, New York, 1976, ISBN:425-03093-8; Bowen, Charles, The Humanoids: FSR Special Edition No. 1, FSR, London, 1966; Vallee, Jacques, Computerized Catalog (N = 3073); Vallee, Jacques, Challenge to Science: The UFO Enigma, Henry Regnery, Chicago, 1966; Vallee, Jacques, Preliminary Catalog (N = 500), (in JVallee01); Vallee, Jacques, A Century of Landings (N = 923), (in JVallee04), Chicago, 1969; Schoenherr, Luis, Computerized Catalog (N = 3173); Carrouges, Michel, Les Apparitions de Martiens, Fayard, Paris, 1963; Binder, Otto, What We Really Know About Flying Saucers, Fawcett T1863, Greenwich, 1967; Hall, Richard H., The UFO Evidence, NICAP, Washington, 1964; Olsen, Thomas M., The Reference for Outstanding UFO Sighting Reports, UFOIRC, Riderwood, 1966; Phillips, Ted R., Physical Traces Associated with UFO Sightings, CUFOS, Chicago, 1975; Delaire, J. Bernard, UFO Register Volume 7 (1976), Data Research, Oxford, 1976; Rosales, Albert, Humanoid Sighting Reports Database. Donald Johnson indicates that on October 14, 1954, at around 7:00 p.m. Messr. Duvivier, a farmer in Meral, Mayenne, France observed an orange sphere land and he walked out to approach it. When he got close he found it was shaped like a flattened dome, 5.5 meters in diameter, and it gave off a blinding light, which illuminated the countryside for about 200 meters. It was also transparent, and a dark figure could be seen inside. After remaining at ground level for 10 minutes it left by flying to the north, while a bright cloudy misty material fell slowly to the ground at the site. When the witness arrived home he found his clothes were covered with a white film of adhesive substance, not unlike paraffin wax. The sources are indicated as Aime Michel, Flying Saucers and the Straight Line Mystery, p. 174; Jacques Vallee, Passport to Magonia: A Century of Landings, case # 255, citing La Croix, October 16, 1954; Richard Hall, The UFO Evidence, p. 97; Coral and Jim Lorenzen, Flying Saucer Occupants, p. 31. A farmer observed an orange sphere land and approached it. He found that it was shaped like a flattened dome, 5.5m in diameter, and gave off a blinding light, which illuminated the countryside for about 200m. It was transparent and a dark figure could be seen inside. After remaining at ground level for 10 minutes it flew north, while a bright cloud slowly fell to the ground at the site. When the witness arrived home he found his clothes covered by a white film of adhesive substance, not unlike paraffin wax. A farmer saw an orange object land in his field. Approaching, he saw a domed disc so brilliant that it illuminated the fields for more than 200 yards around. It was transparent, and a dark shape could be seen silhouetted inside it. After 10 minutes the luminosity changed from white to red, and it took off. At the spot was left a slowly settling luminescent mist. Arriving home, the witness found his clothes covered with a soft white substance resembling paraffin, which soon evaporated. *Oct. 14, 1954 - At around 7:00 p.m. Messr. Duvivier, a farmer in Meral, Mayenne department, France observed an orange sphere land and he walked out to approach it. When he got close he found it was shaped like a flattened dome, 5.5 meters in diameter, and it gave off a blinding light, which illuminated the countryside for about 200 meters. It was also transparent, and a dark figure could be seen inside. After remaining at ground level for 10 minutes it left by flying to the north, while a bright cloudy misty material fell slowly to the ground at the site. When the witness arrived home he found his clothes were covered with a white film of adhesive substance, not unlike paraffin wax. (Sources: La Croix, October 16, 1954; Aime Michel, Flying Saucers and the Straight Line Mystery, p. 174; Jacques Vallee, Passport to Magonia: A Century of Landings, case # 255; Richard Hall, The UFO Evidence, p. 97; Coral & Jim Lorenzen, Flying Saucer Occupants, p. 31). Baptiste Potin was riding by bicycle, climbing the hill at the exit of the village, on the road to St. Poix, when he suddenly saw an orange ball which landed on the road about 600 meters from him. It turns out that it was a discoidal form of four to five meters in diameter whose luminosity illuminates the surrounding landscape, translucent in shape like nylon. In the middle was a motionless black form. At the end of eight to ten minutes, the craft rose to become round again and disappeared towards Le Pertre. The witness then went to the spot where the ball had stood and noticed that there was still a sort of cloud from which fell like bright snow. When he arrived at his workplace he noticed in the light that he was covered with a kind of sticky fluff like wax that an energetic brushing could not completely remove because many white spots remained visible. Sources are indicated as L'Indépendant (Château-Gontier) for October 23, 1954; Aimé Michel, "Mystérieux Objets Célestes", pages 295 et 298; C. Garreau and R. Lavier, "Face aux Extra-Terrestres", pages 141-142; Michel Figuet and Jean-Louis Ruchon, "OVNI: le premier dossier complet des rencontres rapprochées en France", pages 162-163; Jean Sider, "Le dossier 1954 et l'imposture rationaliste, page 195. This database records that same case.... 18 times! 19541014 14.10.1954 Meral France 08.00 p.m.
What happened in Méral on October 11, 1954? On that day an extraordinary event took place on Meral; which made a great noise at this time throughout the country. The main witness was Baptiste Potin. Early in the morning, Baptiste, on his way to his work (Rte de St Poix), perceived in the sky a red ball, the size of the moon; the more he advanced, the more it grew as it rushed towards him. The ball, reaching the width of the road, suddenly landed close to him, becoming orange. At this moment, the dynamo of the bike and the watch of Baptiste Potin were blocked (these 2 apparatuses were never able to operate again). Terribly shocked, he tries to "recover his spirits" and at this moment he sees again the ball decrease in size (without a line in the middle) in the sky, moving a little to the right towards "Chanteil". As it moves away, the craft becomes a "cigar" and is surrounded in the middle by a black line, followed by a long, narrow, dark red trail. The gendarmes (and the curious) questioned Baptiste (still very shocked), and were able to observe on his jacket a sort of white fluff (like bright snowflakes ...). In view of the indication on the size similar to that of the moon and the orange color, it is necessary to check the presence or the absence of the moon that Monday, October 11, 1954, at 6 o'clock in the morning in Méral, latitude: 47° 57' 38" North, longitude: 0-° 58' 50" West. The moon was there, low on the horizon. Direction 275° 40' and elevation 2° 0'. It rose at 05:30 p.m. the day before and sets down at 06:14. It is therefore in a situation conducive to misunderstandings. It still had to not be in the form of a crescent, given the description at the beginning of the observation: "a ball". It is indeed the case: its phase was of 0.98293, it is indeed a Full Moon with 98.3% of its surface illuminated. There remains the question of the direction. If the witness looked at his "ball" by turning his back to the moon, we should forget this explanation. If he looks straight at the moon, and does not say a word about the presence of the moon in addition to the "ball", this explanation will be considerably reinforced. The reports fortunately give us some indications, though no quantified direction is indicated. [nb1] indicates that he left the town of Méral, going up a hill that goes towards Saint-Poix. The "ball" would be in front of him near a power transformer, it bars the way. At the end the "ball" had left "at high speed towards the North-West, towards the Pertre." [le1] and most ufological sources have reported that the ball "took off towards the north" or "disappeared towards the north". [ma1] indicates that the thing, at the end, is heading a little to the right, towards "Chanteil". It is not surprising that he observed it for about ten minutes. The road is totally straight between the two communes, for 4 kilometers. How did the moon "leave" to the north? If the witness rode until Saint-Poix, the moon could not seem to change direction because the road is totally straight. But nothing in the story tells us that he went as far as Saint-Poix by the road. I suspect he was going to a workplace on the left of D4; there are several roads leading to dwellings or farms or other (Les Barres, La Viotterie, La Méhoderie, La Petite Herronerie, Les Haies, La Mascotière). Turning then on his left towards one of these places, he could be the victim of the illusion according to which the Moon appears to change location; it seems to depart to the right, that is to say, towards the North as he branches off towards the South. Now, we are indeed told that he was going to "Les Barres de Méral" or that he "arrived at the Barres Farm". He would have logically turned on his left, then placing the "ball" in the direction "Chanteil" or "Le Pertre" - this is the same NW direction. It does not escape me that the ball is said tto have been "high in the sky" initially; but should we be astonished at what may have been a misunderstanding, an approximation? It may have seemed relatively high in the sky to the witness who interpreted it as a craft, or simply higher initially than later, but not actually at a high elevation. The fact remains that the road is a straight line exactly in the direction of the setting moon. If the witness saw a craft, this craft must have landed "on top of the moon", he should have seen the moon and mentioned that. But no, he sees only one ball, so how would it not be the Moon when almost everything matches the moon? Then, we have the shape changes. They are explained very well by the Moon. Initially, the Moon appears round; it is indeed the full moon, still above the horizon. "Posed" on the ground, "it takes on the appearance of a flattened disc in the shape of a dome": of course: when it sets, passing more and more under the horizon, the witness sees only the upper part of the Moon. Better: we were told that he was biking uphill. Then the moon, which is very low at this hour, was masked by this hill as long as he ascended it, and then appeared round again after he reached the top. Then the moon begins to hide behind the horizon. So, finally, by "moving away, the machine becomes 'cigar,'" says [ma1]. The reason is that, descending more and more beneath the horizon, there remains only the upper part, increasingly thin, less and less thick and less and less wide, leading to believe that the "craft" is going away. The color, orange, even red, is not surprising. It corresponds to a "red moon", a phenomenon that can occur when the Moon is low. It is precisely this color all the same unusual for the Moon that is often a factor causing such misunderstandings. There would be the mystery of the stopped watch and dynamo; but I have a strong doubt about this since it appears only in a very late (about 2017); whereas none of the press sources of the time I have at disposal mention this. Finally, what about the "white fluff" that was difficult to remove completely from his clothes? It is impossible to locate the exact place where he thinks the saucer landed. What I subdued was that he passed near a place where this "snow" was hovering, and deduced that it came from the saucer. 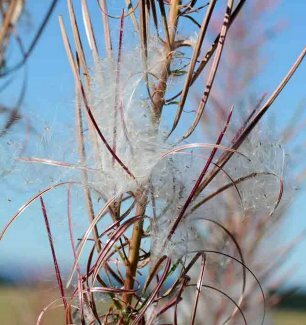 Is it absurd to suppose that he had in fact passed some place where some plant let go of such fluff? 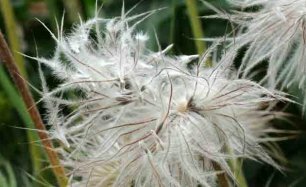 There is no shortage of plants that can cause a kind of white fluffy "snow", much less recognizable than seeds of dandelions, "diaspora" plants, or plantes that release seeds. 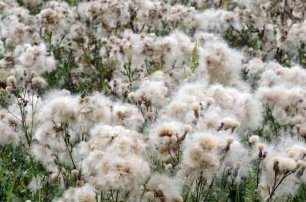 Some make sorts of "fluffs" that make them difficult to remove from a garment. 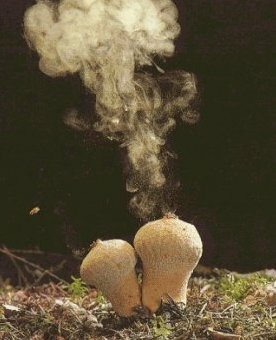 In addition, I wonder if mushroom spores could not be at the origin of this "snow" and its traces compared to wax or paraphine; but some research I did failed to find bulletproof confirmation that such a thing can occur. Finally, I obviously have no "scientific proof" that the whole affair is a mistake caused by the moon, but I do not see what would disprove it. 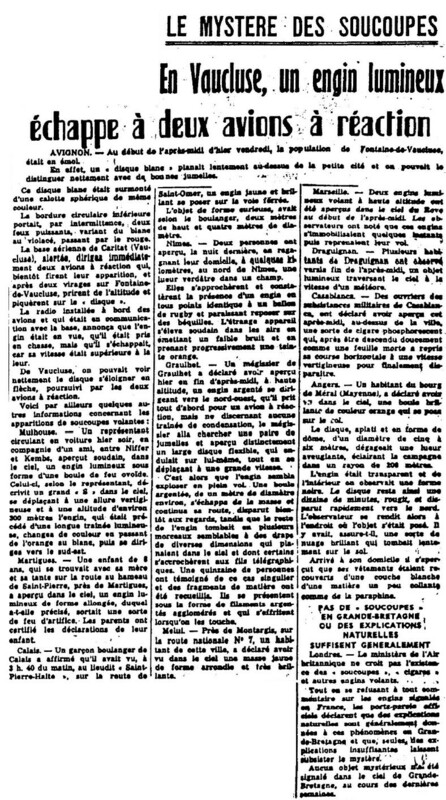 [nb1] Article in the regional newspaper Les Nouvelles de Bretagne et du Mans, Le Mans, France, October 14, 1954. [---] Article in the national newspaper La Croix, France, October 16, 1954. 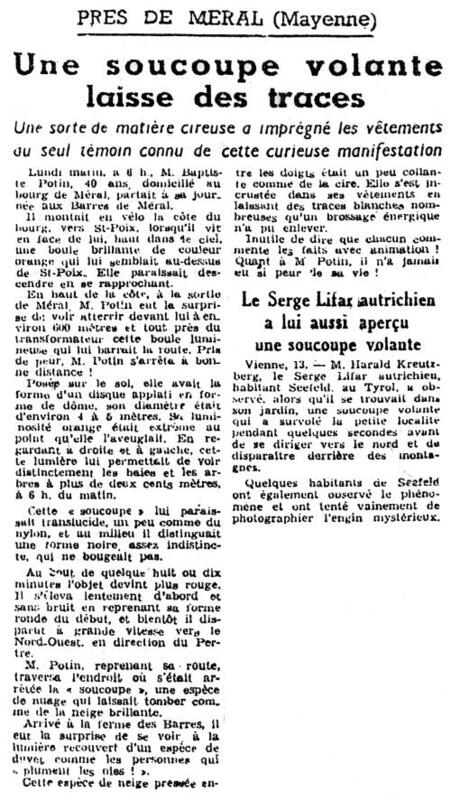 [---] Article in the newspaper L'Indépendant, Chateau-Gontier, France, page 6, October 23, 1954. [am1] "Mystérieux Objets Célestes", book by Aimé Michel, Seghers publisher, France, pp 236-237, 1958. [am1] "Flying Saucers and the Straight Line Mystery", book by Aimé Michel, Criterion Books publishers, USA, 1958. [mc1] "Les Apparitions de Martiens", book by Michel Carrouges (aka. Louis Couturier), Fayard publisher, France, pages 81,225, 1963. [---] "The UFO Evidence", book by Richard H. Hall, NICAP, USA, 1964. [lo1] "Flying Saucer Occupants", book by Coral and Jim Lorenzen, Signet Books publishers, USA, pp 32-33, 1967. [jv1] "Un Siècle d'Atterrissages", article by Jacques Vallée, in the ufology magazine Lumières Dans la Nuit (LDLN), France, @43. [am1] "A Propos des Soucoupes Volantes", livre par Aimé Michel, reprint of "Mystérieux Objets Célestes", Planète publishers, France, pp 215-216, 1969. [gl1] "Face aux Extra-Terrestres", book by Charles Garreau and Raymond Lavier, Delarge publisher, J'ai Lu, France, page 142, 1975. [fr1] "OVNI - Le Premier Dossier Complet Des Rencontres Rapprochées En France", book by Michel Figuet and Jean Louis Ruchon, Alain Lefeuvre éditeur, France, pp 162-163, 1979. [js1] "Le Dossier 1954 et l'Imposture Rationaliste", book by Jean Sider, Ramuel publisher, France, page 251, 1997. [um1] "dans le Tarn> La grande vague de l’automne 1954", article in the UFOmania ufology magazine, Didier Gomez publisher, France, #41, page 19, Fall 2004. [ar1] "Humanoid Sighting Reports", compiled by Albert Rosales, circa 2003. [gz1] "RR3 - Le Dossier des Rencontres du Troisième Type en France", book by Julien Gonzalez, Le Temps Présent publishers, France, pp 129-130, 2014. 0.1 Patrick Gross April 14, 2003 First published. 1.0 Patrick Gross December 19, 2008 Conversion from HTML to XHTML Strict. First formal version. Additions [mc1], [lo1], [ni1], [go1], [jb1], [ud1], [ud2]. 1.1 Patrick Gross December 20, 2008 Addition [js1]. 1.2 Patrick Gross April 1, 2009 Addition [fr1]. 1.5 Patrick Gross August 15, 2010 Addition [le1]. 1.8 Patrick Gross November 15, 2014 Additions [cm1], [um1], [ub1]. 1.9 Patrick Gross February 7, 2017 Additions [gz1], [ma1]. Addition of the Summary. Explanations changed, were: "Not looked for yet."